CLEARWATER, Fla., April 3, 2018 /Christian Newswire/ -- Addiction is an ever increasing international crisis. Please join us in praying for those bound by substance abuse and other compulsive behaviors this weekend, April 7– 8, 2018. Addiction in America is an ever increasing national epidemic! Millions of Americans have addictions. 115 people die every day from overdoses from opioids alone. This rate has tripled in the past 20 years. Make a formal commitment to join with believers in Christ from around the globe this coming weekend. Put on the full armor of God and fervently pray in spirit and in truth. We are seeking to enlist millions of prayer warriors from around the world to join us in battle! If you believe that God is calling you to intercede for the addicted please contact us. To find help for addiction through prayer and Christian ministries log on to our web site: www.justprayno.org. 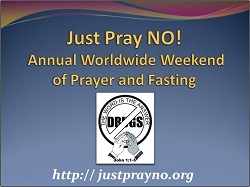 To learn how groups can participate in our annual prayer event, click on "Information on the Annual Worldwide Weekend of Prayer" or email: justprayno@aol.com.